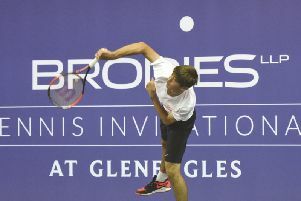 It was hugs and cheers all round after Scot Adam Hall and his English partner, Peter Mills, pulled off a hard-earned victory in the men’s doubles semi-finals at the Scottish Open Grand Prix at the Emirates Arena in Glasgow. A relatively new partnership, the pair produced their best ever result with a 21-19, 18-21, 21-19 victory over Jelle Maas and Robin Tabeling, a talented Dutch pair who threatened to spoil the party by staging a late match fightback. In a nerve tingling finale, the British pair were 19-13 ahead in the decider but then lost the next six points in a row before finally getting the job done. “It is 100 per cent my best ever result to get to my first Grand Prix final,” said 20-year-old Hall, a former European Junior medallist. “The fact that it is in Scotland makes it even more special. Not that it was easy for everyone in the crowd. Hall’s mother was in the Arena but not watching the on-court action, while his sister, Katie, was hiding under her jacket by the time it got to 19-all in the third. Mills, 28, admitted it had been a tough finish to the match, but he couldn’t have been happier with the form and resilience of his young partner. “They played really good stuff towards the end,” he said. “But when they were so far behind they had nothing much to lose and just started throwing everything at us. “But, luckily, we managed to get it over the line. Once we got to 19-all I knew we were going to win. It was Hall and Mills’ sixth tournament together. They didn’t win a match until the fifth, when they reached the quarter-finals of the Bitburger Open in Germany. Confidence soaring, this week they knocked out the German No.3 seeds – Raphael Beck and Peter Kaesbauer – and have beaten two very good Dutch pairs. In the final, they will face the Danish top seeds, Mathias Christiansen and David Daugaard. For Mills, it is a third Scottish Open final. He won the men’s doubles with Marcus Ellis, this year’s Olympic bronze medallist, at the Kelvin Hall in 2010 and was runner-up with the unrelated Andrew Ellis last year. Another thrilling semi-final was a women’s singles. With both players clearly close to exhaustion, France’ Sabrina Jaquet finally overcame Dane Mia Blichfeldt 13-21, 22-20, 23-21. Blichfeldt had knocked out Scot Holly Newall in the first round.